March was a rough month for markets, with all three major U.S. indices finishing down. The Dow Jones Industrial Average lost 3.59 percent, the S&P 500 Index fell 2.54 percent, and the Nasdaq Composite was down 2.79 percent. For the quarter, the Dow and S&P were down 1.96 percent and 0.76 percent, respectively. But the Nasdaq gained 2.59 percent. Even as prices dropped, the fundamentals continued to improve. According to FactSet, as of March 29, the estimated earnings growth rate for the S&P 500 was 17.3 percent—the highest since 2011. But technical factors also weakened during the quarter, with the indices closing close to long-term trend lines. International equities fared similarly. The MSCI EAFE Index declined 1.97 percent in March and 1.70 percent for the quarter on concerns over Russian aggression and potential protectionist policies. The MSCI Emerging Markets Index declined 1.97 percent in March, but strong performance to start the year helped it hang onto a 1.33-percent quarterly gain. Technical factors weakened toward quarter-end, taking both indices close to their long-term trend lines. Fixed income rebounded somewhat in March, as yields dropped following a large increase in February. The Bloomberg Barclays U.S. Aggregate Bond Index gained 0.64 percent in March but lost 1.46 percent for the quarter. High-yield bonds, which are less affected by interest rate movements, were also weak. The Bloomberg Barclays U.S. Corporate High Yield Index lost 0.60 percent for the month and 0.86 percent for the quarter. March was a solid month for economic news. Gross domestic product (GDP) growth for the fourth quarter of 2017 was revised up to a strong 2.9 percent annualized. The Federal Reserve recognized this economic momentum in March with a 25-basis-point hike in the federal funds rate. Market participants expect two to three more rate hikes in 2018. This news helped keep confidence near multiyear highs. 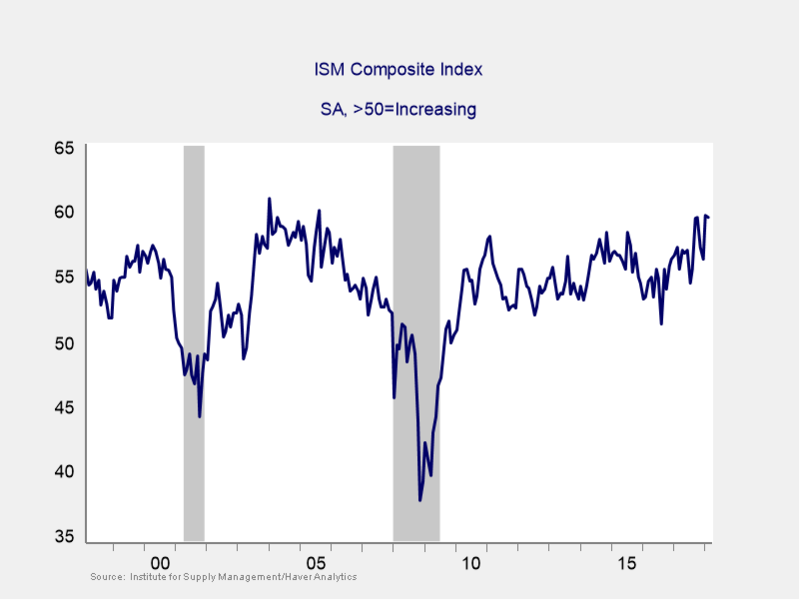 On the business front, following a slight dip in December, the Institute for Supply Management Composite index rebounded to near highs last seen in the mid-2000s (see Figure 1). Consumer confidence improved as well—to levels last seen in the 1990s. Business and consumer spending data improved, too. Both headline and core durable goods orders, which reflect business investment, bounced back from a weak January. In particular, core business investment grew by 1.2 percent for the month, which was more than enough to offset earlier declines. Housing is another area to watch. Homebuilder sentiment declined in March, and housing starts and building permits both declined by more than expected. Supply shortages for new homes could lead to a material slowdown. Meanwhile, political risks remain a concern. The White House’s announcement of tariffs on steel and aluminum imports and on Chinese goods raised the perception of risk. The tariffs appear to be more negotiating tactic than settled policy. Even so, the potential economic damage that could result from a trade war spooked markets during the month. The first quarter had its ups and downs, but improving fundamentals and high confidence levels should keep driving the economic expansion. Markets may be more at risk, though. The political risks strike directly at confidence, which could drive more volatility. As always, a well-diversified portfolio that matches your risk tolerance and time horizon remains the best way to pursue your financial goals.